The 2013 start of the New York Giants season did not go the way Tom Coughlin and Co. anticipated. Turnovers came early and often while breakdowns in execution late stalled a potential comeback. The Monday morning quarterbacks are out in full force blaming whoever they can and they are probably well justified in most cases. The negatives we witnessed could spell trouble for the Giants if they continue to be long term problem areas. I think its prudent to be wary of the these areas but I also think there were handful of positives that should be pointed out. Terrell Thomas – For a guy who hasn’t played in 2 years, he played pretty well. He is an X Factor on this defense and his presence looms large especially with the Stevie Brown injury. If he is able to stay healthy and lock down the slot position that allows Antrel Rolle to play his more natural free safety position while Ryan Mundy will play closer to the line. With Thomas in there and playing well, it’s not a necessity to play the 3 safety look that Fewell was forced to play so much last year. As of right now, they are only carrying 3 safeties on the roster until Will Hill gets off suspension. If Fewell is forced to play 3 safeties, that means Cooper Taylor will be playing and in his brief action last night when Mundy went down he’s clearly nowhere near ready to play significant minutes. This makes Thomas uber important to this defense. Perry Fewell– Speaking of out much maligned defensive coordinator, I thought he had a pretty decent game plan for Dallas. He took away their best player in Dez Bryant and dared them to beat them in another way. Dallas pretty much moved the ball with the short stuff to Austin and Witten all night. Dallas really only had one long TD drive of 71 yards in the 2nd quarter. Besides that their touchdowns resulted directly from the turnovers or from short fields from the turnovers. I still wish he would dial up some blitz some more because the D ends just weren’t getting home until later in the game but overall I thought he had a solid game plan. Middle of the D line -The new beef or the “bigger butts” as Fewell so eloquently put it last week really paid dividends. Dallas pretty much didn’t even try to run the ball as they realized there weren’t going to be able to do anything on the ground. Shaun Rogers, Mike Patterson & Linval Joseph all had multiple moments in the Dallas backfield. If they can get that type of push on a regular basis then once the D ends can start firing on all cylinders we should see sack totals start to jump. It was nice change from last year as multiple times they were gashed right up the middle. Nicks, Cruz, Randle – The big “3” all played really well and most importantly looked relatively healthy. Nicks appeared to be finally playing at full speed as he was taking things noticeably half speed in the preseason. 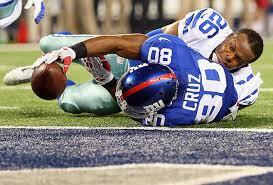 Cruz’s heel didnt seem to have any effect given his 3 touchdowns including a 70 yarder. Randle made some real nice catches and gives this offense a dimension it sorely needed. Good or Bad, today’s Giants live and die by the big play. They are not a time of possession offense any longer. They put such an emphasis on taking shots down the field. Having these 3 at full health will just encourage this more. Justin Pugh – The first rounder out of Syracuse held up pretty held in his first start. He was matched up again Demarcus Ware a few times and held his own. He wasn’t prefect but he didn’t let up too many pressures. I thought it was a great stepping stone for our right tackle of the present and future. If he continues to play like that David Diehl will not be getting his job back. Turnovers – SIX. SIX turnovers. That is just unacceptable on every level. Clean it up. Enough Said. 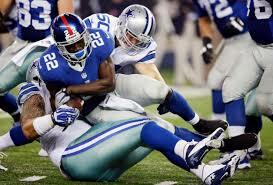 David Wilson – That was the epitome of a nightmare performance. He had such a great opportunity to take a strangle hold of the starting job not just for this season but for years to come. He now must find a way to work through this. I am nowhere near giving up on him but he’s going to have to prove things to his teammates that he can be trusted with the ball. More importantly he needs to convince his very old school coach. Tom Coughlin has been put in a very interesting predicament. He knows that he must use Wilson as he’s his most explosive back. However, he will not put him in knowing that ball security can be a constant issue. Obviously, Wilson also is in a tough spot. How will this game affect his psyche? He didn’t look like he was taking it well on the sidelines. The fumble he had last year in the first game was his only of the season as he didn’t put the ball on the ground at all after that so he is capable of holding on the ball. Both Tiki and Bradshaw had fumbling problem in the past which they were able to overcome. He must do the same. Wilson’s problem is compounded by the fact that he was horrific in pass protection last night. Eli Manning– I’ll be the first to admit, I’m probably one of the biggest Eli apologist out there. I love the guy and he is no doubt the greatest quarterback in Giants history. It’s really not even up for debate. There isn’t another guy I would want with the game on the line. However, his tendencies for turnovers can be maddening. His fault or not, they will continue to drive Giants fans crazy. In his 10th year now, he needs to take more care of the football, hands down. It was a shame because in the second half of the game, he was really finding a rhythm during the comeback and it looked like they had one more miracle in Dallas awaiting. Honestly, the last one didn’t look like his fault and was more of a communication error with Scott. I’m probably nitpicking here with Eli but we just cant have a 20+ interception season. It’s Take 3 in the Manning Bowl with Peyton owing an 2-0 record. Is third time a charm for Eli? The Denver offense looked pretty formidable last week. I can guarantee you that if the Giants even have half of the turnovers they had last night it will be a blowout. Denver will not allow the Giants to hang around like Dallas did. They will need to take care of the football and get pressure on Peyton. The Giants have a lot of questions to answer before week 2. Most importantly, what are they going to do with the backfield. Do they bring back Wilson to start? Do they bring in a vet like Jacobs or McGahee like has been reported? I think you can bet the house that somebody that was not on the roster for game 1 will be on the roster for game 2. My money is on McGahee as he’s familiar with the Denver offense and he was half way productive before his injury last year. I don’t think they want to have a Jacobs reunion. What’s the status of Prince Amukamara? He sustained a concussion last night and nothing has been reported as to his availability next week. The thought of Aaron Ross starting is something Giants fans should be very nervous about.